Masaccio (Italian: [maˈzattʃo]; December 21, 1401 – summer 1428), born Tommaso di Ser Giovanni di Simone, was a Florentine artist who is regarded as the first great Italian painter of the Quattrocento period of the Italian Renaissance. According to Vasari, Masaccio was the best painter of his generation because of his skill at imitating nature, recreating lifelike figures and movements as well as a convincing sense of three-dimensionality. Masaccio died at twenty-six and little is known about the exact circumstances of his death. 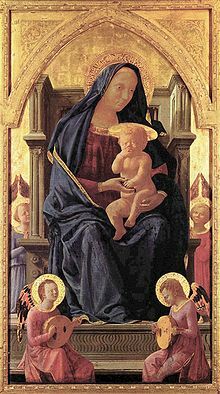 Masaccio was born to Giovanni di Simone Cassai and Jacopa di Martinozzo in Castel San Giovanni di Altura, now San Giovanni Valdarno (today part of the province of Arezzo, Tuscany). His father was a notary and his mother the daughter of an innkeeper of Barberino di Mugello, a town a few miles north of Florence. His family name, Cassai, comes from the trade of his paternal grandfather Simone and granduncle Lorenzo, who were carpenters/cabinet makers (casse, hence cassai). Masaccio's father died in 1406, when he was only five; later that same year a brother was born, named Giovanni (1406–1486) after his father. He also was to become a painter, with the nickname of lo Scheggia meaning "the splinter." In 1412 Monna Jacopa married an elderly apothecary, Tedesco di maestro Feo, who already had several daughters, one of whom grew up to marry the only other documented painter from Castel San Giovanni, Mariotto di Cristofano (1393–1457). There is no evidence for Masaccio's artistic education, however Renaissance painters traditionally began an apprenticeship with an established master around the age of 12. Masaccio would likely have had to move to Florence to receive his training, but he was not documented in the city until he joined the painters guild (the Arte de' Medici e Speziali) as an independent master on January 7, 1422, signing as "Masus S. Johannis Simonis pictor populi S. Nicholae de Florentia." Masaccio returned in 1427 to work again in the Carmine, beginning the Resurrection of the Son of Theophilus, but apparently left it, too, unfinished, though it has also been suggested that the painting was severely damaged later in the century because it contained portraits of the Brancacci family, at that time excoriated as enemies of the Medici. This painting was either restored or completed more than fifty years later by Filippino Lippi. Some of the scenes completed by Masaccio and Masolino were lost in a fire in 1771; we know about them only through Vasari's biography. The surviving parts were extensively blackened by smoke. In the twentieth century, the removal of marble slabs covering two areas of the paintings revealed the original appearance of the work. What's the good word on Masaccio?